Roasted corn. Boiled corn. Corn soup. Corn salsa. It's sweet corn season and what better time to be doing a cooking demonstration than now. 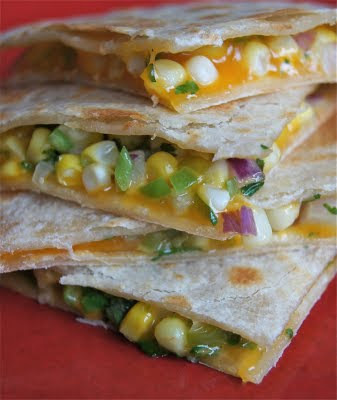 This coming Saturday, I will be at the Minneapolis Farmers' market demonstrating how to assemble sweet corn quesadillas. So over the weekend, I've had the great pleasure of testing and re-testing ( a really tough job) this recipe. Essentially, the filling is a salsa: lots of corn, fresh cilantro, onions, and jalapenos, if you like. How you prepare the corn is also up to individual taste. However, I will recommend using roasted corn which has more flavor than boiled or steamed. Don't forgot to stop by the Farmers' Market this weekend for tasty samples! 1. Remove the kernels from the corn cobs, and combine with the rest of the ingredients, except the tortillas and cheese together. Mix well. 2. Place one tortilla in the bottom of a warm skillet set over medium to low heat. Place two tablespoons of the salsa mixture evenly on one half of the tortilla. Sprinkle about a tablespoon of cheese over the salsa mixture, and fold the other half of the tortilla over the top. Press down lightly and flip the quesadilla. Cook until the quesadilla has lightly brown on both sides, and the cheese has melted. 3. Repeat with the remaining ingredients. Serve with a side salad for lunch or in small triangles as an appetizer. Natasha, it was so much fun to meet you last weekend at the market. These quesadillas were delicious, I can't wait to try them. Hope you had a great first day of school! Same here Kristen! I took a look at your blog; beautiful! Good luck with the rest of your MPH! And hope to see you at the market again.